I’m not surprised that Jim Molan took issue with my recent post on amphibious operations. 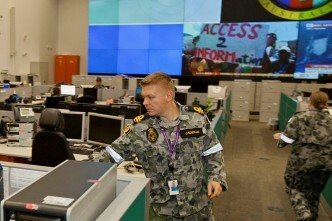 It’s clear by now that Jim is far less comfortable with the current resourcing of the ADF than I am. Or, as I’d prefer to cast it, Jim thinks spending more on Defence would retire more strategic risk than I think it would. But the first thing to do is to agree what we disagree about. Jim interpreted my post as saying that the LHDs should be relegated to serving out their lives involved in ‘only regional operations for Australian military capabilities, most likely involving predominantly humanitarian assistance’. Well, no. 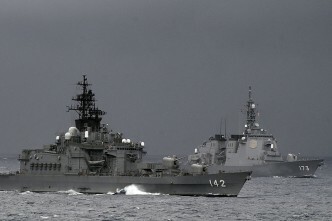 The capability that these ships will bring goes far beyond the delivery of humanitarian assistance, and will provide government with more options and will deliver a greater end effect than their much less capable predecessors. Below is a figure I use in Staff College lectures to frame the discussion on amphibious operations. This (admittedly simplified) model characterises operations in terms of their logistic complexity and the degree of opposition they face. 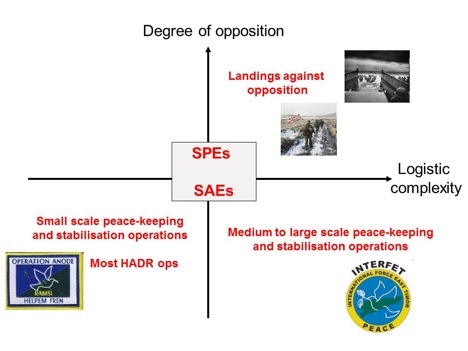 In the lower left quadrant we find relatively straightforward and small scale operations such as the Op Anode assistance mission in to the Solomon Islands. In the lower right, the logistically taxing but still very lightly opposed INTERFET mission to Timor Leste. LHDs will be of enormous value in those sorts of operations (as would a fast ferry, but I digress). Moving up the degree of potential opposition, we come to Service Assisted Evacuations and Service protected Evacuations. * I’ve placed them near the middle logistically, but an evacuation of foreign nationals or local civilians at risk in the event of a breakdown of law and order or violent suppression by local authorities from one of the more populous regional nations could be very challenging indeed. I think there’d be very little argument that the Australian people and government would expect the ADF to be able to perform all of those operations. And the coordination of land, sea and air assets to conduct those operations would require a lot of ‘joining up’ of the ADF, just as Jim observed. In the top right quadrant we find complex, opposed operations. I’ve illustrated it with the Falkland Islands War and the order-of-magnitude more demanding D-Day landings. Again, I don’t think there’d be any dispute that the latter is outside the scope of the ADF. So what we’re really arguing about is whether we need the ADF to be able to do ‘Falklands-like’ operations (or contribute a ‘Falklands scale’ amphibious force to a coalition operation). Strategic security policy is always about minimising general strategic risk, over an often unpredictable future, through various shaping, hedging, deterrence and war-fighting capability measures. It’s therefore profoundly disappointing to again see so much commentary purporting to explain away reduced defence investment because of a supposed absence of specific military ‘threats’ as the commentator perceives the situation now. They are both right—more capability (which almost inevitably requires more money) is more capability, and it provides more options. But I still don’t think the case is made that Australia would be manifestly safer if we set the bar higher for defence spending and capability in general. In particular, there are possible futures we all tacitly agree that it’d be silly to plan for and hedge against—the United States turning its military power against us, for example. So, again, we’re arguing about where on a continuum of future risk management we want to sit. Serious thinkers like Hugh White and Ross Babbage have argued at various times that we need the capability to fight (or even ‘tear the arm off’) a major power independently. Jim doesn’t say that, but argues for 2% of GDP to be spent on conventional arms and a truly joint ADF combat capability. My position is a step further down the ladder. I claim that there are sensible strategies that allow us to retire a lot of the risks we’re likely to face and increase the chance of our major ally being with us if we need them without a substantial increase in defence funding. We can’t all be right, which is precisely why we need to have these sorts of arguments. I concede that we might get thrown a curve ball by future events—but that’s true no matter what level of spending we adopt. I’m sure this isn’t the final word on the subject, but let me summarise my position. 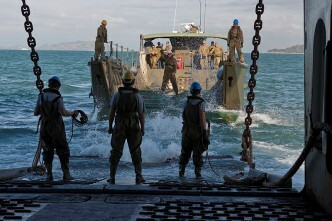 I think that joint amphibious operations up to and including the complex and dangerous business of service protected evacuations in the face of violent opposition and substantial civil disturbance are sensible things for the government to prepare the ADF to do, but I’m unconvinced of the cost benefit beyond that. * I use the ‘old’ terms SAE and SPE rather than the replacement Non-combatant Evacuation Operations because I think there’s a significant difference in the two for the purpose of this discussion.